Sorry for the delay on this post, friends and future friends. I've been preparing for a cross-country move this month so things are a bit hectic. Well, without further delay let me recap episode 10 of The Time That I Loved You, 7000 Days and then we can talk about it a bit. When we last left off, Ha Na was at her friend's wedding, waiting for Won to show up, when he finally does looking like a gruff mountain man after his month-long sabbatical. After the wedding they go out drinking with their high school friends who say that things seems weird between Won and Ha Na and they insist things are normal. We see a flashback to the night Ha Na told Won she couldn't push Seo Hoo away. He tells her that he needs to leave so that he can come back as a friend who can be by her side. After the drinking the two walk home together and Ha Na asks what he did for a month. He tells her that he just walked the whole time. She tells him he seems changed, more masculine. Mi Hyang is happy to see Won; she's missed him and at work he finds out he's won the kindest employee award which basically turns him into their spokesperson. While Ha Na is at work, Seo Hoo shows up and tries to flirt with her while she's trying to read him his press release. Won goes out drinking with his friends from work. He gets drunk and starts singing "I Miss You" over and over. Later, Seo Hoo is in his practice room and Ha Na comes in. He pulls her into his lap and into a very intimate embrace.and then drives her home holding her hand. But her phone rings while they're in the car and he tells her not to answer the phone when he's with her. At work the next day Ha Na's ex's wife warns her that the design team is trying to steal her project (again!) 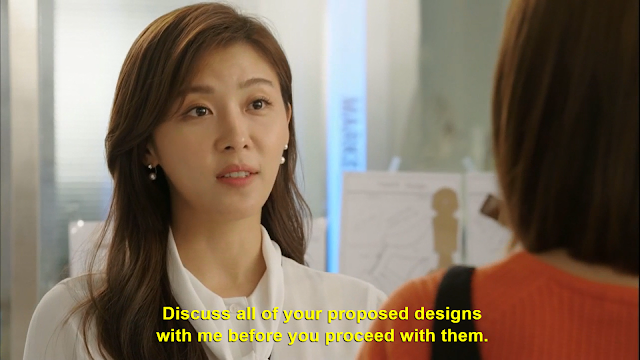 and she confronts the evil design team lady and tells her off. Meanwhile Seo Hoo's manager tells him that his agency is suing him for breach of contract, but Seo Hoo acts like it's a good thing- saying he'll reveal everything they did to him. While Won is at work training newbies So Eun tells him that she wants to stay by his side and be a friend to him like Ha Na is and he tells her not to. Ha Na and Won run into each other at the grocery store after work and drink beer together under the awning as it's raining. Then they both go home. Ha Na is leaving for a business trip. Dae Bok meets up with Ha Na's co-worker and finds out that she is going on the trip with Seo Hoo. Since the piano concert last episode, Mi Hyang has started fan-girling over the pianist, Seo Hoo's teacher, whose name is Bak Jong Hung. She goes to get his autograph and he calls her ahjumma. She's confused as to why, until she realizes that she literally ran into him one morning when she was in her sweats going to the sauna and called him ahjussi. She leaves embarrassed. Seo Hoo and Ha Na go to board their flight for their business trip and who should be their steward on the flight, but Won. It seems like things are going to get awkward, but Won's always the professional and Seo Hoo doesn't act like a baby and Ha Na smiles at him so while it's painful for Won, nothing goes down. Once Seo Hoo and Ha Na get off the flight, Seo Hoo tells her he wants to have dinner with her friends, including Won. She tells him that it's going to take some time for her friends to come around to him. He tells her he wants to know who she's with and what she's doing at all times. Seo Hoo takes her home and her mom is outside when they get there. She is horrified to see Seo Hoo and brings Ha Na inside immediately. Both of her parents are upset and Ha Na apologizes as she tells them she's back together with him. Meanwhile as Seo Hoo is leaving he sees Won. He tells Won that he wants to be friends with him like he's friends with Ha Na and tells Won not to make him the third wheel of his friendship with Ha Na. Won pretty much ignores him. Ha Na's dad is so upset by the whole Seo Hoo fiasco that he goes out drinking and Won meets him. He asks Won if he knew to which Won admits that he did. Ha Na's dad says he's disappointed that as her friend Won would let her get back together with him after how she behaved last time they were together and the fact that she planned an engagement party without her family. He tells Won not to come around their house anymore. Seo Hoo is back to pestering Ha Na at work the next day when she's trying to actually get stuff done. After work they're in his practice room, playing the piano together. Without asking Seo Hoo takes a selfie of the two of them and then posts it online, announcing their relationship. Ha Na gets upset and then leaves. Won is out drinking with his high school friend, Chan Soo, and we see a flashback to Won and Ha Na in college who promised to be in each others' graduation photos even though they graduated at different times since Won had to enlist in the military. They both made it to be in each other's photo. Back to present day Ha Na is at home and calls her high school friend, Na Young, who has absolutely no sympathy to her troubles with Seo Hoo since she thinks it was foolish to get back together with him. Ha Na decides the fight was silly and texts Seo Hoo saying the picture was cute and asking if he wants to go have a picnic the next day. While Ha Na's at work the next day her mom is cleaning when she slips and falls and hurts her back. Dae Bok is home and finds her so he goes and gets Won for help. Ha Na is at work and hears about her mom so she tells Seo Hoo that she needs to go home. Won and Dae Bok finish cleaning the house for Ha Na's mom. When Ha Na gets home she finds the whole family and Won eating black bean noodles together. After they eat Won and Ha Na go for a walk and Won gives her a whistle that he used while he was travelling. Meanwhile we see that Seo Hoo has arrived at Ha Na's house and is kneeling before her parents. We end the episode of a flashback to Won and Ha Na in college and find out that in order to be at Won's graduation picture, Ha Na gave up a chance to go to Paris to train for work. Won promises that when the next chance comes in two years, he'll personally pay for her ticket. And we know from the earlier episodes that she met Seo Hoo in Paris so if she hadn't missed the first trip she'd had never met Seo Hoo. Okay so here's what I have to say about all this. -Did anyone else think that when Ha Na was going over Seo Hoo's press release it sounded a little like she was trying to sell the viewers on Seo Hoo since we all hate him? Lol. -I know I've said it before, but it's so noticeable I have to mention it again - Ha Na and Seo Hoo have some crazy chemistry. If she's with him based on that factor alone I understand her...just a tiny bit. I mean dang, look at the way he pulls her into his lap! -Seo Hoo is quite controlling. First he tells her not to answer her phone and then he wants to know everything she's doing. Who does this guy think he is? Will the arrogance never end? -I understand that Won chose to leave and she just wanted to be honest with him, but isn't Ha Na being a little too cruel? She doesn't seem to take his feelings into consideration at all. 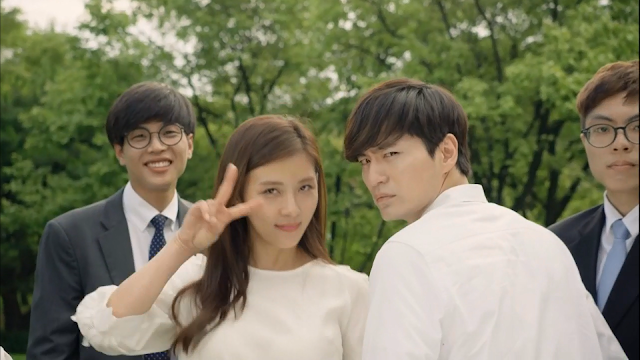 -I was really proud of Ha Na for sticking up for her friends this time around. Last time she was a horrible friend, always ditching them and putting Seo Hoo first, so it was nice to see her tell him that they were going to need some time. And she also apologizes to her parents whereas she didn't take their feelings into consideration at all last time.I can't believe she planned an engagement party without them. That makes sense, though, I was wondering why they weren't there. What possible reason could she have for doing that when her family loves her so much. Seo Hoo was a really awful influence. If she was really considerate of her parents she would have never gotten back together with Seo Hoo, but I guess that ship already sailed. -Ha Na's dad was way too harsh on Won, telling him not to come around. But I guess he was just hurting and he looked really happy to have Won there after his wife hurt her back. He really didn't want Won to leave after all. He just didn't have anyone else to express his feelings to. 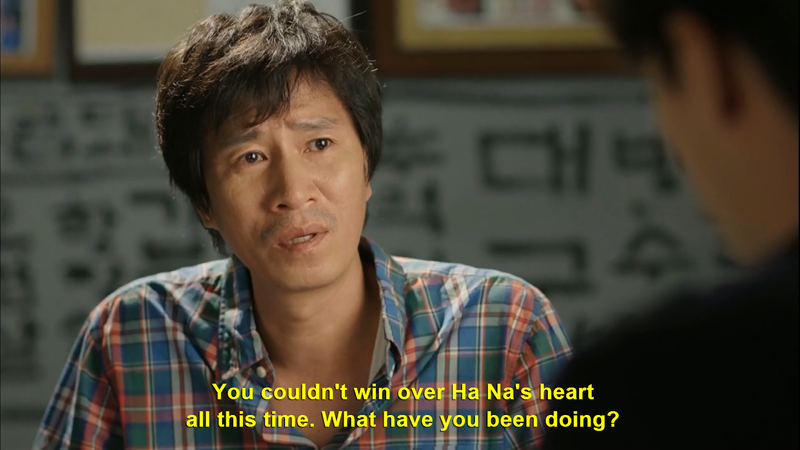 -My biggest thing is why does Ha Na think that Seo Hoo would have changed? People don't typically change. That's life. She changed, which is great, but he's acting like the same person and has made no promises of having changed so she was really naive to believe he had. Okay so my thoughts for this episode end there, but stay tuned for future recaps to come for the rest of the drama. In the meantime check out my homepage for this drama for more recapse and Drama Clubs by clicking below. The Time That I Loved You, 7000 Days.